In 2010 we purchased our first 3D printer, a Dimension bst1200es from Stratasys. My intent from the off was to use it for making functional parts, over pure prototype uses. This meant that the traditional SLA process, which is very costly to own and operate, was not a consideration. I wanted parts made of a material that could stand being put into actual finished goods. This led to FDM (Fused Deposition Modeling). The material it prints is ABS plus, which is an excellent plastic for internal bits as well as structural components, within reason. I wrote a bit on this, with a video link during Week Thirteen of the 52 in 52 project that year. Since then, I have printed literally thousands of parts on this machine. I have guns fitted with stocks and stock parts made from the material, I have a motorcycle loaded with it in various uses, from fender supports to electrical housings. I’ve used it to make trade show light fixtures, sculptures, and holding fixtures for welding and vises on the CNC machining center (another 3D device). For more thoughts on 3D Printing, you can download a copy of The Real 3D’s of 3D Printing, a presentation I gave on the topic to a 3D printing and maker group. Recently, in the interest of lowering printed part cost and expand capacity, I added a second 3D printer. 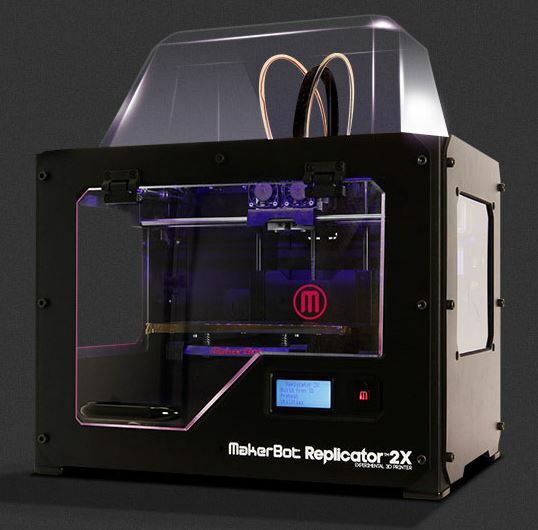 This time I chose one of the leading “affordable” 3D printers on the market – a Makerbot 2x. Like the Dimension, it can print 2 different materials on the same build, but I will get into the details of this, and the differences between them in a moment. The purpose of this little review is to offer anyone who is considering one or the other approaches (low cost vs. commercial level) an insight into what to expect. I will say right now, the hype surrounding the affordable level printers is all exaggerated and misleading. The revolution in 3D manufacturing they speak of, is not going to be founded on the products they produce. The quality they claim can be achieved, on commercial equipment. The ease of use they profess exists, does, in commercial equipment. The affordable printer in this comparison is out-matched on every level by the commercial machine – the question then is… how much of the higher performance the commercial machine delivers does one need. I was able to hit the ground running in 3D printing, and was immediately addicted to going from idea to solid part in a few hours. While this fixture was printing, I was off on the next project, so it is like having a little robot prototype worker helping out, so I can focus on other things. As a designer, I have made product, building, room, facade and lighting study models using conventional methods employing hand tools and CNC machining. This is often a time consuming effort, and depending on the complexity of the finished design, ranges from accurate enough to good-enough to get by. 3D printing has changed that. Now, not only can we produce an accurate representation of a finished design, in a growing number of cases, the 3D printed assembly IS the finished product. No tooling required – just print what you need and be done with it, perfect for one-off, or very small production runs of custom components. The more I use these machines, the more I see what they mean to the future of design and manufacturing. As is my usual, the following review is from direct experience and use of the products involved. I know there are other machines, and other techniques for making parts. However, I find the value of reviews based on reviewers reading spec sheets and marketing brochures useless. I can read as well as anyone, why would I need someone to tell me what they read from the same marketing materials I can get. I also find reviews by writers who are not in the business of actually using the products in real-world application just slightly better than those written by the brochure readers. So, limited as it is, this review is a real world, putting the hardware to work summation of findings and observations. I will also not go into a long winded explanation of the technologies involved. The two machines here use FDM (Fused Deposition Modeling) process. This involves a print head tracing the exterior and interior fill and features of a part with an extruder that deposits a thermo-plastic string to build a part up one layer at a time. To avoid having models made from solid blocks of plastic, interior cavities can be filled solid, or with an open crisscross pattern to support the next layer, overlaid with a solid layer to close it up for an exterior surface. FDM parts made from ABS plastic are strong. However, in the X-Y axis (flat plane) they are stronger than the vertical Z plane, due to the potential for the layers to separate. The strength between layers differs between machines, and different build parameters. Build layers of between .004″ and .015″ (depending on the printer) create more or less definition of the ring effect (steps in round or sloped surfaces and rings in the smooth side walls) when the parts are created. However, that is not the complete picture. ABS is UV sensitive, so finishing is needed if it is exposed to daylight for long periods. It’s worth keeping in mind that there is a slip in dimension from CAD file dimensions to actual 3D product no matter what process is used. Extrusions twist and bend a little, plastic molded parts shrink a bit, machined parts change as tools wear, punched parts vary according to tooling tolerances. In this, I have found the 3D printed parts as close to design dimensions as any other 3D part generated using any other process. I’ve found that printing a part, rather than cutting, drilling, or manual machining, results in a superior part, when plastic is an acceptable end use material. Having the capability to make parts, and review designs in full 3D is addictive. In the future, if enough 3D printers are in use, one can imagine sending a 3D model to a customer, who then simply prints it for review, will replace having to send someone a hard part, or struggle with viewing rendered 2D images. They could then test the part or product, modify it, scan it and re-turn the modified 3D model to the designer to incorporate changes, made from physical manipulation. One can also imagine sending someone a gift via-email, that they load into their own printer and print out to enjoy. The dream is huge, the reality… well, it needs a fair bit of work. 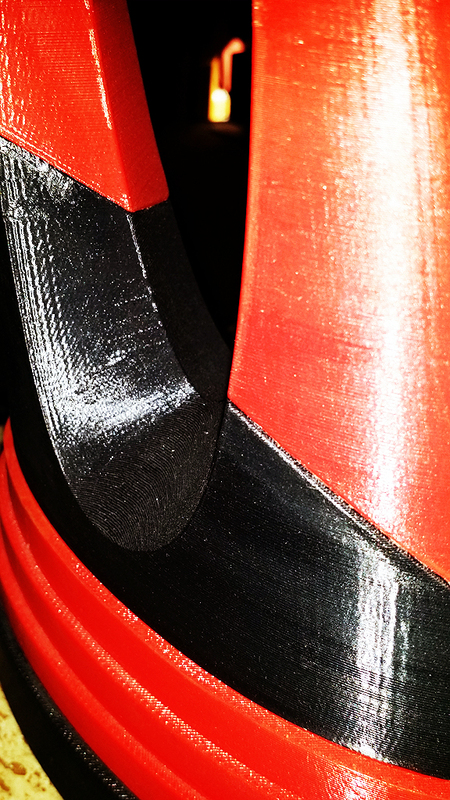 All FDM printed parts have some texturing due to the way layers are built up from extruded material. All FDM machines do create parts in layers, so there are horizontal lines present in the vertical surfaces. Depending on the finished shape, there may be a “zipper” line, where the extrusion starts and stops at each layer. None of the effect accuracy, but may need smoothing if the texturing is not acceptable. I only smooth parts when the finished product is decorative or being painted. Most of the time there is no issue with the finish produced. Sanding is easily done, and returning the smooth semi-gloss finish to the material can be accomplished with a quick wipe of Acetone using a smooth cloth. I also use bondo, and polyester sanding filler, which bonds very well to ABS, then one blast of building primer, sand it smooth with 600 grit and paint to produce a very pretty finished part. 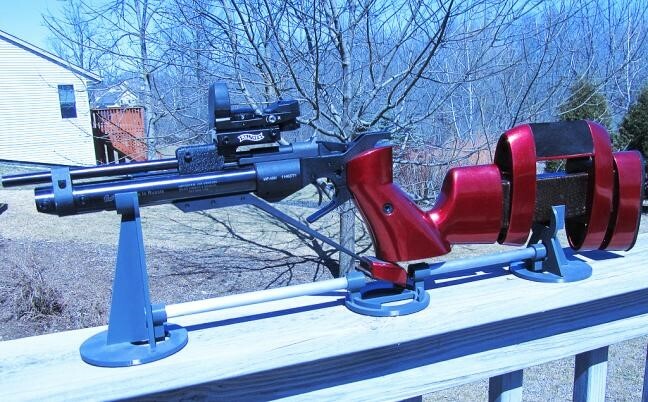 Painting FDM parts also eliminates damage from UV exposure, so for anything used outdoors, this is a good way to go. There are now many paints available designed for painting ABS and other plastics directly, and they work on FDM printed parts equally well. Screwing ABS parts together can be done in several ways. My favorite for ABS to ABS assemblies is to simply use screws designed for direct threading into plastics. These have coarse triangular threads that bight into the material very well, without cracking. Wood and sheet metal screws will also work for lightweight connections. I have also tapped the material using standard metal taps, and the threads hold for screwing a lid or cover on, but not for heavily loaded joints. The stock on this air pistol was printed on my Dimension 3D printer, strengthened with epoxy filler, sanded and painted. This has been in use for 3 years and has not cracked or chipped. Printing the final part with a cavity to insert a T-nut is another very solid solution, as is simply making a cavity for a standard hex-nut, something I do frequently. I’ve also had excellent success using heli-coil thread repair inserts and threaded body inserts designed for wood products directly into the plastic, creating a metal thread for machine screws. In other words, with a little forethought, screwing printed plastic parts together is easily done. Gluing ABS parts together is readily accomplished using solvent adhesives. I use Plastruct Plastic Weld. It sets quickly, and after an hour, the bond is as strong as the part. For heavier duty joints (large areas), I use Weld-On 4707, which has a little more body to it, creating a very hard bond with the plastic. I also use 3M 08115 Panel Bonding Adhesive to glue ABS to anything else, including metal, other plastics, wood, glass, whatever. This Urethane based adhesive can also be used as a hard filler material inside parts themselves, and in joints. 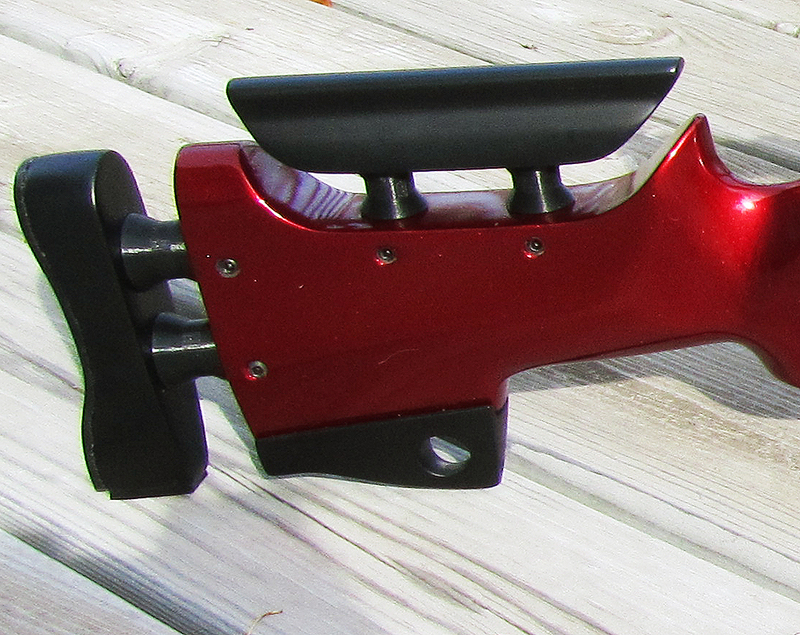 The black components shown here are 3D on this bench rifle stock were printed solid, sanded smooth, primed with filler primer and painted. Finally, when I want to create a water and/or air-tight vessel, or harden the ABS to make it more structurally rigid, I use BJB 1614 Epoxy, which is designed to seal 3D printed parts. The end result is a very solid part that can hold water and air at pressure, and increases the temperature tolerance of the finished part to 350 degrees (400 intermittently). Epoxy sealed parts can also be sanded and painted easily, making this an excellent foundation for parts being used as sand-cast, silicone and urethane molds, where release agents will be applied, and vacuum mold patterns where a smooth hard finish is critical to final part quality. 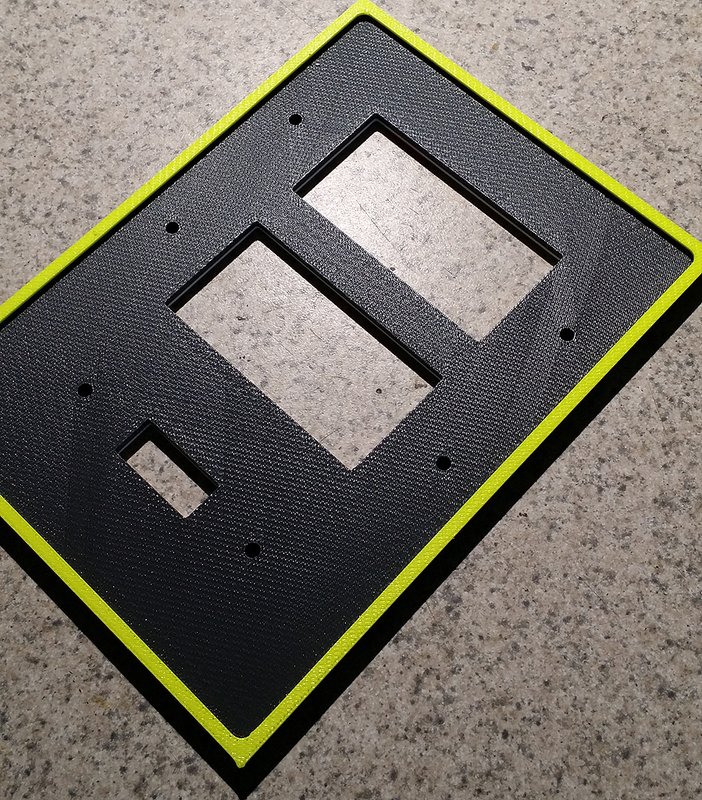 I have found that it takes very little effort to make printed parts look great in a wide range of applications. I have plastic parts literally everywhere in the house and use them regularly to fix things, hold things, and decorate with. The ability to finish these parts is critical to their being useful over the widest range of uses. For this reason, FDM printed parts in ABS is a great choice. The Dimension bst1200es in about the size of a refrigerator. This is the brochure image of my printer. I am only using it here to avoid having to clean my office to take a picture of the same machine. Lets get this out of the way right off. 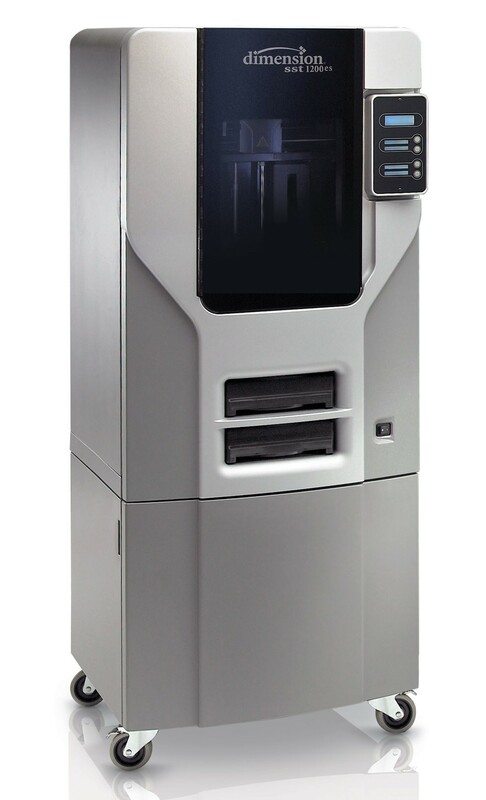 The costs of commercial 3D printers are in the neighborhood of a small car, north of $22K for the bst1200es by the time all the hardware is put in place, add a few more nice features and the costs can be north of $30 at the ground floor. That does not include the annual maintenance/warranty extension contract of another +/-$2,400 a year, which by the way, is worth the money. Some folks run bare on this regard, and that is an option. However, for me, the added safety net and fast service made sense. That said, the Dimension machine has been fantastically reliable. In 4 years of regular duty, the machine has had two failures. A print head packed with plastic because I was taking liberties over-re-using modeling trays, and a mother board failure that involved updating several surrounding components. The maintenance contract covered them both, which puts us about even in total costs involved, with faster service turn around. 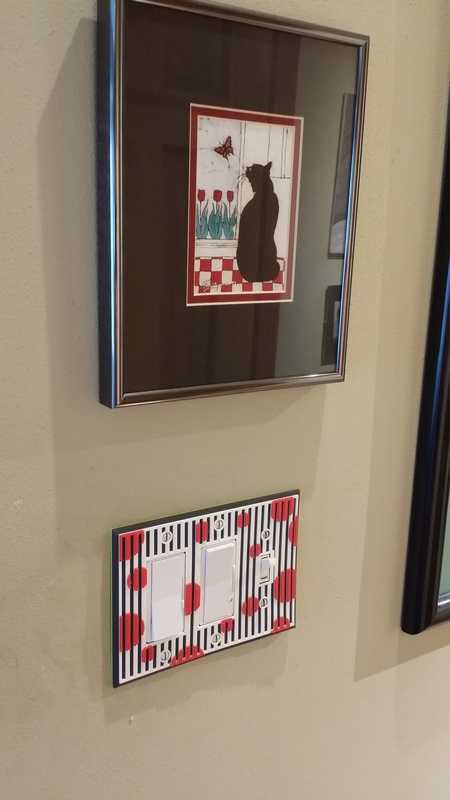 This switchplate was printed with pauses between layers to allow me to change colors from yellow to gray, to white, then red. The finished part was put directly to use, with no other finishing work required. The finished quality of the parts are very good overall. 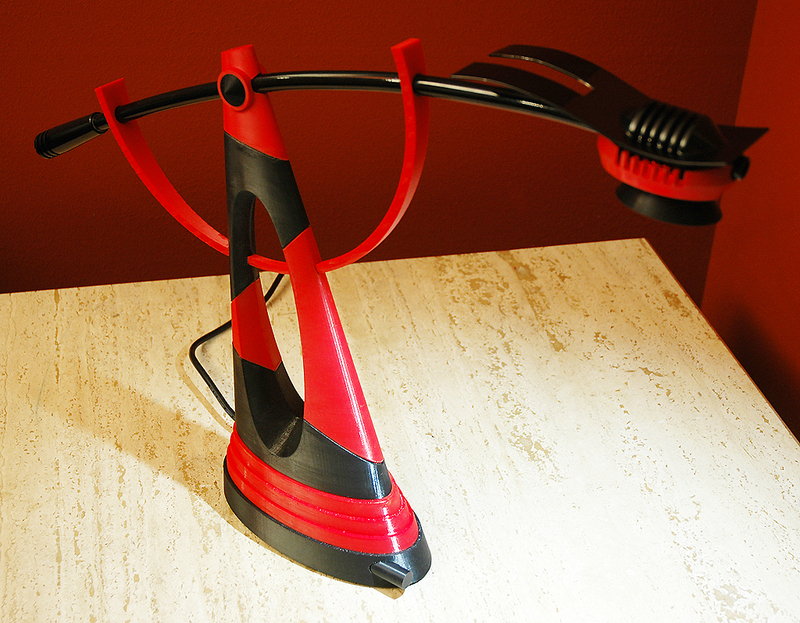 They do not de-laminate, look good, and are nearly as strong as many molded parts are of the same scale. Thesides have the typical uniform FDM layer lines, while the base of every part has a texture created by the build platform support layer, somewhat like fabric patterning. 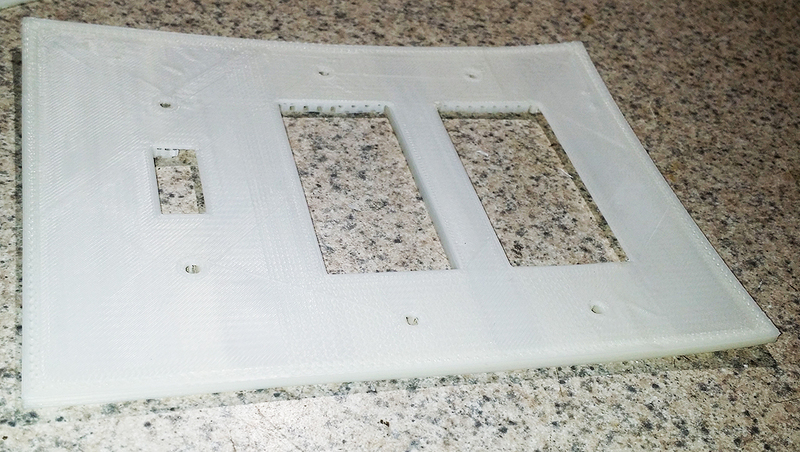 The top surface will have lines in it as well, from the print fill pattern. There are no missing lines, gaps or spaces in the exterior surfaces of the finished parts. The software for converting a CAD (.stl) file to a print file is very easy to use, and required no training at all. In a short time, you learn tricks to part making, which starts with the part file, that makes this even easier and more effective. In checking accuracy, I have found, within my ability to check, accuracy is very tight. Model layers can be chosen as either .010″ (standard) or .015″ (faster pint speed), with fill and support options to create the desired final part density. It’s all intuitive and easy to navigate. The final printed part layers are previewed on screen. You can also pause before starting any layer to change model color by layer, or for other purposes I won’t go into here. The Dimension prints the model material along with a second material that is used as a support to keep parts held firm and stable during the build, and allow cavities and overhangs to be present on the printed part with no concern of collapsing, or the printer extruding plastic into air. The Dimension software creates support structures using the second material automatically, so its nothing that has to be designed. Our machine uses what is called break-away support material. This means that the support material is simply broken off the final part, sometimes requiring a little persuasion with a pick or pliers. The final part is not effected by this, as the support material is not bonded to the ABS. Others use soluble support materials that are dissolved in a chemical bath to melt the supports away, which costs more in both the machine as well as accessory solvent wash station. The advantage of soluble supports is that small details require less picking, and are less likely to get packed into small crevices or spaces that defy removal. However, I have a little secret… I discovered that the the breakaway support material is made of HIPS (High Impact Poly-Styrene), which dissolves in Limonene, a natural citrus based de-greaser that has no effect on ABS plastics. Dip the finished part in a little tank of this orange smelling stuff, let it soak and the breakaway support material dissolves away, just like the soluble support material in the more expensive machines. I usually break away the bulk of support structure first, and use the Limonene to dissolve the small bits that where they occur. This image shows the model base, support and model layers the Dimension utilizes to create warp-free precise models. All Dimension machines employ numerous features to insure the best possible build quality. The print heads are a complex combination of heaters and small air directors, designed to uniformly deposit the material. The build platform is heated to maintain adhesion with models of any thickness. Models are built on ABS modeling bases, that are removable and re-usable after cleaning off the previous models base layer. The build platform is automatically leveling, so there is nothing to setting up a print, except loading the desired material, a model base, close the door, and press “Print”. The build chamber is heated, which insures optimal layer to layer adhesion. The model materials are loaded into the machine in sealed cartridges that include a chip that tells the machine what it is (color/material) as well as how much material remains in the cartridge. You can print 100% of the available material with no fear of running out, as the machine will simply use it up, then pause to wait for you to load a new cartridge, resuming the print job, with no re-starting, or visible breaks in the final product. Stratasys is the top dog in FDM, they invented it, and they have it mastered. This shows in the operation and features included in the Dimension machine. This machine is beyond doubt exceptionally well sorted. The build volume of the bst1200es is 10″ x 10″ square x 12″ high (1200 cubic inches). Multiple parts can be placed on the build area and printed together, as long as they share layer height settings and material color. I use two methods for this. Method one involves using the software to open individual files one at a time and lay them out using a packing feature, that visually allows you to place multiple parts on the build area. This is fine for projects where the total number of parts does not crowd the build platform. Method Two is to create an assembly in SolidWorks, or a collection of parts in Rhino, where I can lay them out as tightly as I wish, even overlap them by laying one layer over the top of another, separated by support material if necessary. Then, open that file and place it as one part in the build area, and let er rip. The back surface of this part is clean and attractive as-is. The patterning is a result of the support material laid down to keep the part in place as it is built up, and to support the recessed section of the design. We purchased our machine from Fisher Unitech, who also services us with SolidWorks. They have on-line purchasing for the consumables and plastic materials, that works flawlessly. Service is excellent as well overall, so the experience of owning the machine has been what one can expect from a professional infrastructure. The machine is dead solid reliable. Send it the print file, and let it run. It will even email you when its done. We leave it running overnight regularly, our little manufacturing machine – working as we sleep. I did invest in a battery backup power supply, so that when the power goes out when I am not around, the print job just continues. Power outages mid-run means wasted time and materials, as the job needs to be re-started from layer zero. Bottom line: I installed the machine myself, turned it on and was making parts the first day – and have been making parts continuously for four years on this machine – with an insignificant number of screw ups or failures. This has been an outstanding experience. 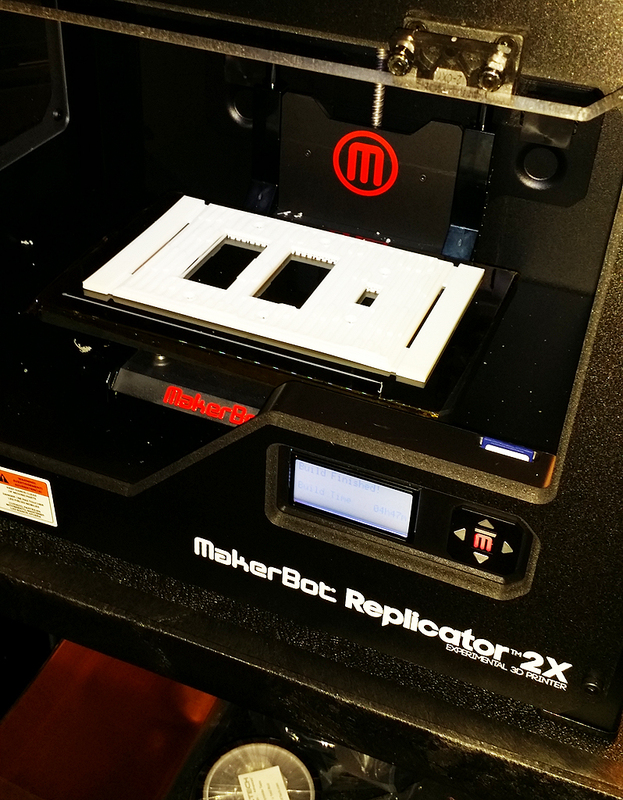 The MakerBot 2X. Again a brochure image, simply because it is a cleaner image than the one I would get from my messy office space. The machine fits nicely on an AV cart that is roughly 24″W x 18″ D x 42″H, on urethane castors. The world is abuzz about the availability of affordable small 3D printers that anyone can own and make parts with at home and in small offices. These range in price now from $700 to $5,000, and use the same basic FDM process the Dimension does. While these smaller companies claim to be re-inventing the maker and manufacturing universe by innovating low cost 3D printing for the masses, make no mistake – they are simply taking advantage of the expiration of several patents that Stratasys has owned until the last few years, allowing them to deploy machines using part of the technologies that make FDM possible. While they are affordable, they are incomplete on many levels. They cannot employ a heated build chamber, and several other key features that make the commercial grade machines superior in reliability in operation. That said, they do offer a low cost alternative, and are forging new ground, in that they are bringing 3D printing to a lower stratus of the market. This opens the doors for small design firms, hobbiests, and tinkerers (now called “Makers”) to enjoy part of what 3D printing can be. There are now emerging small SLA style printers into this same universe, making parts using lasers in polymer goo. These too are far less expensive than commercial machines, and equally hobbled by the lack of complete technology that makes commercial machines what they are. Makerbot is one of the earliest creators of 3D printers for the Maker marketplace. Their first machines were sold as kits to be assembled by the customer, housed in laser cut plywood cabinets, also assembled like flat-pack furniture. Since then, the 3D printer market has expanded to include dozens of competitors, yet Makerbot has maintained its lead by constantly updating its product. Recently purchased and cash infused by Statasys, the latest Makerbot offerings are well made, ready-to-run out of the box, and more complete than ever. Whether they are the best printer on the market or not is a matter of argument. They are very good machines for what they are, and rank well in the market. In keeping with the theme of affordable 3D printing, the Makerbot 2X costs less than 1/6th what I paid for the Dimension – $2,500 for the basic printer. Add accessories, a cart to put it on, some materials to get things rolling, and the total for us came to a touch north of $4,000. No maintenance contract to speak of, so that’s that. Materials are also cheap, in the $48 per kilo range. That comes to around $0.67 per cubic inch. Since there is no maintenance contract, and the equipment amortization is minimal, the end cost for material use is around $1.20 per cubic inch, or about 10% that of the Dimension. That is a huge difference, and why we chose this machine. However, the material is not as strong as the ABS Plus we print in the Dimension. The material is also not loaded in neat cartridges with electronic status chips, it is simply supplied on a spool, to be manually loaded and monitored. The 2X allows printing in 2 materials. This can be two colors, or one color and support material. The support material is the same HIPS material used in the Dimension, so breaking it away and dissolving it is accomplished the same way, when its used. The lack of software sophistication means the chances of getting the setup wrong are high. This warped mess was the first of four attempts at printing a wall plate. Only after modifying the part did it finally come out in useble condition. This started as the same file the Dimension printed first time out, in 4 colors, without a fail. The 2X does offer a great deal more flexibility in materials use than the Dimension, which is limited to only those colors of ABS Plus offered by the company. There are more colors, including a silver/grey, purple, and many shades of blues and greens. In addition to this, the 2X can print other materials to deliver transparent parts, flexible parts, electrically conductive parts, strengthened plastics parts. Materiasl can be found from Makerbot, or purchased from any number of suppliers, a growing list, offering specialty materials that the Dimension simply will not support. This was my second motivation for choosing the 2X. I can now print a part in nothing but support material. 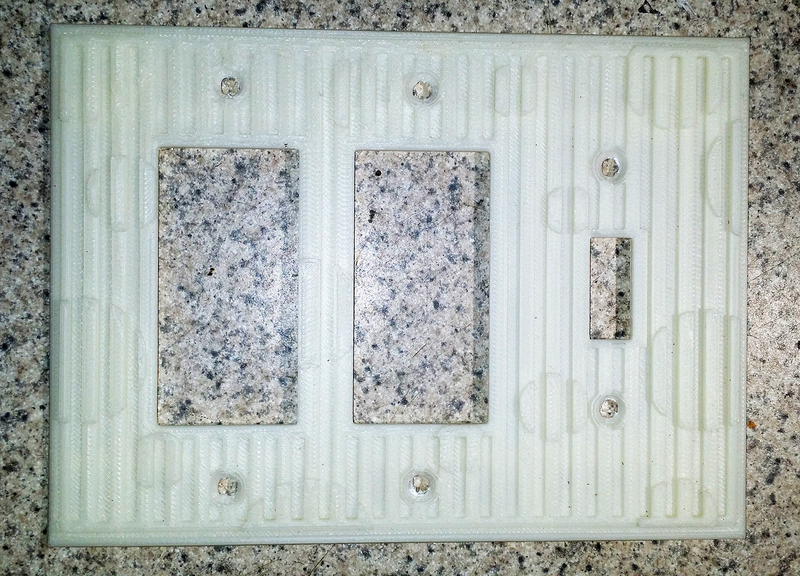 This means I can print a part, smooth it and use it to create an epoxy mold. When the mold material cures, I simply dissolve the support material out, allowing me to make small injection molded copies (on another machine I recently purchased for making injection molded plastic bits). This method can also be used to create plaster molds for metal casting. This level of flexibility creates new opportunities for uses of a 3D printer, that are beyond the scope of the commercial machine. Other MakerBot Replicators print in PLA, a material made from corn, which results in nice parts, but far less durable for end use, and are water soluble. The 2X can print PLA, but is not configured for it, missing cooling fans for setting the material as it is printed. A few experimenters have added these fans successfully, so anyone willing to tinker with it, can pretty much make it print anything they wish. The 2X includes an enclosed cabinet and heated build platform. However, the build area is decidedly small. The manufacturer lists greater area than you ca actually use when using the 2 print heads. The wiper/wall structure it uses takes up print space, limiting it to about 4.5″ x 6″ x 6″H, or 162 cubic inches of volume. 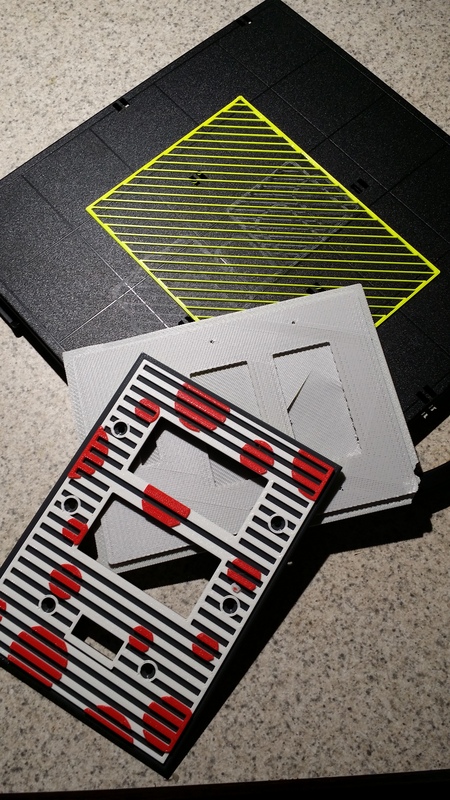 Single material prints can be a little larger, say 5″ x 6.5″ x 6″, or 195 cubic inches. That’s less than 15% of the Dimension’s 1,200 cubic inch volume – which we have filled wall-to-wall on more than one occasion. However, that was a specification I accepted when I purchased the machine. For anyone considering a printer, of any capability, make sure the build space is well matched to anticipated needs. The MakerBot 2X does an acceptable job of printing parts, but the quality is simply not as good as you get from the more expensive machines. With a little work, however, this plate would be presentable enough. The finished quality from the MakerBot is good to poor. While it has a finer layer resolution of .004″ to .012″, this is mostly lost in translation due to poor material control that delivers rougher parts overall than the courser Dimension. The finished parts are simply less refined than the Dimension and less uniform overall. These imperfections can be severe if the print settings are not right for the build. The 2X has the capability of incorporating support structures like the Dimension, but these tend to be lumpier than the model, which telegraphs into the materials printed over it. The issue here is a lack of tip cleaning feature. Where the Dimension has a wiper to clean the extruder nozzle regularly, the Makerbot does not. Instead it utilizes a silly wall structure buildup that sort of works. While the cost saving in materials used is huge, the process of printing is troubling. First, the software for the MakerBot, while easy to use, is not very good functionally. It is slow, fails to create realistic builds – requiring a review of the output to verify what it is showing is actually workable. For example, in a recent project, I found in the preview the software was simply going to print a layer into the air. Not believing it figuring it was an error in the display, I just sent it to the printer. Well, it printed that layer like it showed – into thin air, leaving a stingy mess in the build area, corrupting the part beyond repair. While the machine is capable of custom profiles, this is accomplished through a text editor code, line by line editing – just like the old days of plotter software in the 1980’s. Hardly what I would consider the next wave of custom manufacturing. The software is also glitchy, requiring it be restarted at times due to stalling, and frequently requires re-building a print job, as it has no process for re-turning to previews once they are dismissed. The real issue with the affordable machine is the need to fuss and experiment until a good part is created. In this case, to get one good wall plate required three different failed attempts, succeeding on the forth. The next issue is that the build platform. It is manually leveled, which takes about 5 minutes, and needs to be done frequently. It also does not employ build trays. Instead you build directly on the metal platform, which is covered in tape (Kapton or blue painters tape are favorites). When this gets tired, you strip it off an apply another. The parts are printed onto this surface, so removing them means peeling them off that tape. Its an okay process, but what it has really done for me is demonstrate how cool the built trays are in the Dimension. The real issue is adherence to the build platform. Small parts come loose int he middle of builds, while large parts warp upward at corners, creating bad parts, and messy results. The other issue with this direct-on-platform printing is that one side of the part will have a glossy smooth finish (the bottom flat side on the build platform), while the rest of the part is textured like all other FDM printed parts. When using the support material to reduce this, by creating a raft under the part, imperfections in the print quality of the support material often makes the bottom surface an ugly mess of lines and fuzzy leftovers. This can be fussed with by setting temperatures and speeds differently, but that takes time, and wastes material. Overall, I would say the MakerBot delivers more than one might expect for the money. However, it is still far too fussy and fiddly for general office use at this time, as are every other affordable 3D printer I have had the opportunity to see and touch. Being a member of the local 3D printer Meetup community, I’ve seen a wide range of machines operating, and tinkered with the software the are driven by. They are all suffering the same lack of sophistication that the MakerBot is, and delivering similar end products, with roughly the same amount of supervision and process. Great for those, like me, who will invest the time messing around with the machine and its settings to get what they want from it, but too far away from plug-n-play to accomplish their goal of bringing 3D printing to the general population. This is the wall plate as it finished on the build platform. The added tabs to either side held the part down to avoid warping, which were then cut off once the part was scraped off. That alls said, we purchased our machine directly from MakerBot, thinking this was the path to the best service for the product. While in general, the experience was acceptable, the sales staff is so anxious to place orders, they screw things up with accounts, and come off as immature geeks running out of a garage. The level of professionalism is nothing like what we experienced with the Dimension. The support staff is another story. They have been very helpful and attentive, with very good response to issues. Had we only been able to deal with sales, we would have cancelled the order and went another direction. This is one of those rare instances where after-sale support is superior to sales itself. I expect as I gain more experience with the MakerBot, I will find ways to modify it, tinker it, and develop profiles I can trust to improve its output. However, most of that was not necessary for operating the Dimension. For the MakerBot to be aimed at the consumer market, or to be truly transformational on the level they and other affordable 3D printer makers believe themselves to be, I suggest they need to be better than the Dimension is at delivering a trouble free experience. I cannot imagine typical end users being happy with the effort required and level of failed print efforts that this machine produces. Something too often overlooked is that a 3D printer demands a 3D model to print from. While the kids and makers will mess with “things” and libraries of simple toys and gadgets others have designed, the real utility of thes machines comes in when you are the author of the part files to be printed. In this, you derive maximum benefit from defining the need, designing the part, and putting it to use as designed. If you can’t design or create a 3D file, or modify an existing file from someone else to suit a specific need, the first step, before considering any 3D output device, is to develop skill in creating 3D CAD models. There are several ways to go on that front, from low cost, clumsy 3D programs on the cheap, to expensive and complete CAD packages. 3D printing starts with 3D designing, so that must be nailed down before either of these printers makes any sense at all. For anyone considering use of a 3D printer for parts to be put into service, needing prototypes that can be roughly handled and used for practical testing, the Dimension is an excellent choice. Considering all other methods for creating accurate and reliable 3 dimensional components with any detail at all, and the cost of services for such parts, the expense is not difficult to justify. Once you have one of these machines, you’ll wonder how you functioned without one, especially if you make or design physical things for a living. You can model most anything on this machine with a little thinking about how to arrange and structure the build. In my case, the cost of the machine has been recovered in products built and sold to customers as part of project work, which means that it turns a profit for the business, even at the high material and equipment expense. The build volume is also very well sized for a wide range of uses. I’ve made prototypes over 8 feet long in sections by gluing pieces together, and small sheet metal like parts equally well. The question many will ask is, is the MakerBot 2X usable as an in-house 3D printer alternative to the larger commercial machine? The answer depends on how tolerant you are of investing time in the setup and fiddling with settings and experimenting with builds, to get the part quality you want. Ultimately, the MakerBot cannot equal the Dimension machine’s operational simplicity and reliability, or its printed part quality. 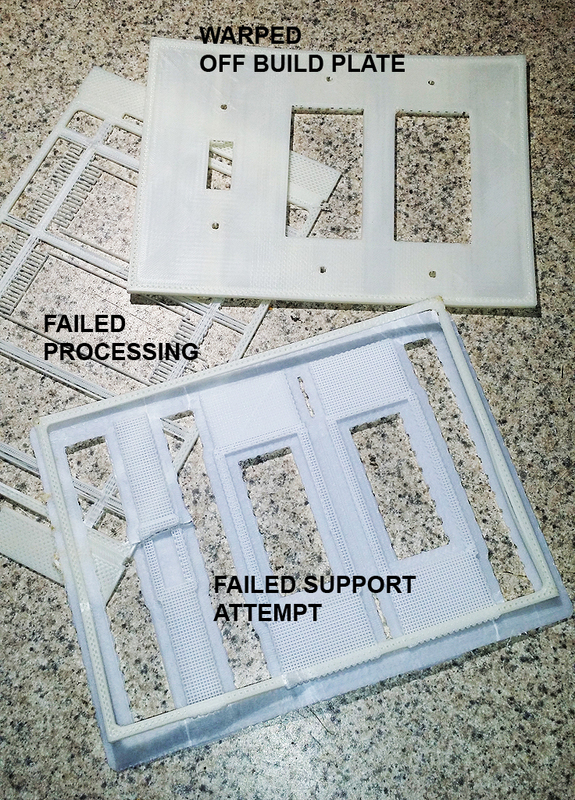 Solid parts made on the MakerBot are susceptable to warping, and are weaker overall than the commercial printer produces. However, if the intent is to print out concept models, or print architectural details for models, or other similar small projects, and you have time to find the machines sweet-spot, it can be made reliable and fun to use. The ability to print more materials of different characteristics is definitely worth considering as well. The small build platform is a limitation, but probably about the most this machine can handle. Every part we have attempted that attempts to use its total build volume has failed in some way, so I cannot imagine having it attempt anything larger. I would have killed for the MakerBot back in the days I was building architectural models at Atlandia. The ability to print window and door details, ceiling coffers, exterior surfaces, structural parts, cabinets, light fittings, and all the fiddly bits that drove us into the wee hours with Exacto knives and glue… But back then, we had no 3D CAD software to work from… Anyway, the MakerBot is an acceptable small 3D printer for doing small simple pieces, both hard functional parts and model level parts for evaluation. However, when it comes down to professional quality finished parts, reliably produced, when time is money, the Dimension is hard to fault- except for that expensive material issue. Comparing the two machines is somewhat unfair. The two are designed for different end users. I am unique in having a combination of needs and tolerance for processes that has put them in this side-by-side comparison. That said, the question of which is the best choice, or whether either are at all, comes down to understanding what you want from a 3D printer, and what the finished parts will be used for. This will define which is the best direction for you. That was a most informative article and really struck a chord with me as I have the Makerbot 2x Experimental. It was problematic out of the box due to some inept assemblers but after a trip to the shop at no cost to me is now happily producing my product. I too fiddled with settings and rafts and supports until finding the right fit for my product. The print quality is as good as the settings used and warping was only a problem when not using rafts or improper orientation or placement of part in the chamber. I’ve not yet gotten oriented with printing two colours or using one extruder for supports/rafts and the other for printing…one thing at a time…but have concentrated on part creation to eliminate need for supports/rafts and eliminate waste. Finish while important is not critical to my products’ end use but that information on ABS and UV exposure was very helpful as my product will most likely be exposed all day long. I too looked at the Dimension but didn’t have the funds since I am just getting started and so far only putting product out there for field testing. We’ve found a product you might find very useful. It’s called Buildtak for the build platform. It improves adhesion and uniformity on the build surface, and gets rid of that awful Kapton tape or blue painters tape.